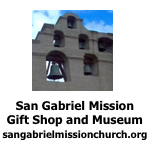 The sky is covered with low clouds and haze this morning, reminding us of our own “June gloom” in southern California. We depart in mid-morning from Lawrence for Lecompton, the first capital of Kansas. A large industrial area outside of Lawrence includes a large warehouse for Hallmark Cards and a distributing center for K-Mart, but we are soon out of town and into the country. Farms dot the landscape and cows graze in green pastures. In a hilly area we arrive in Lecompton, an exceedingly small town, so small that it is hard to imagine that it was once so important. Its main street is only a block long with a row of little shops, basically for the tourist trade. The town was originally called Bald Eagle, but they changed the name, thinking that the name was not sophisticated enough for a state capital. After trudging up steps, we enter Constitution Hall, a two story white clapboard structure built in 1856 and now beginning to sag with age. The plain cottonwood floors creak and the old windows are a bit cockeyed, but it houses a wonderful collection of photos and memorabilia of Lecompton. We can only imagine the history that took place within these old walls. I try to imagine the voices and shouts of the early Kansans as they drew up the Kansas Constitution. The first constitution declared that Kansas would be slave state. But the vote to accept it was considered so fraudulent that they devised a second constitution in which they decided that Kansas would be a free state. This one stuck. There would be no slaves in Kansas. Walking over to the Territorial Museum in what was once Lane University, we see a play about “Bleeding Kansas.” The play is about the attacks from the slave holding state of Missouri who wanted Kansas also to be a slave state. Kansans retaliated and became known as the Jayhawkers. The play, all performed by local people, is very well done, the actors superb in their roles. After the play we walk a short distance to the Methodist Church where the local women had prepared a wonderful lunch for us. We feast on relishes, Cole slaw, pistachio pudding, ham, green beans and home-cooked baked beans. The women are exceedingly friendly and gracious which is typical of the people of the Mid West. All of us are full to the bursting point. After lunch we take a leisurely stroll down the brick sidewalks of the small town, entering some of the shops. In the street are markings for the annual turtle races. After perusing the exhibits upstairs, we descend to the basement where the archives are stored, our guide leading the way. Right away, we notice the chill, the refrigeration necessary to aid in preserving the many papers Dole accumulated over the years. We stroll around in the arctic-like basement, looking up at air ducts and pipes and soft fluorescent light. Rows and rows of boxes containing the important papers rest on a network of steel shelves. Aside from the papers, memorabilia are also kept—quilts, tee shirts, ties, keys to cities, statuettes, trophies, banners and even baseballs signed by players-all related to Dole’s life. 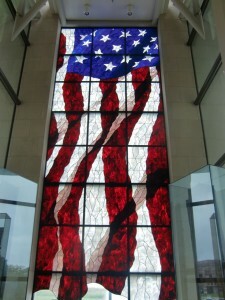 Upstairs again, out of the cold, we marvel at a huge stained glass window of the American flag. Near the flag are girders from the remains of the New York Trade Center destroyed on 9/11. Another stained glass window depicting a typical Kansas rural scene honors the area around Russell, Kansas where Bob Dole was born. We had seen the spot where Kansas was born and modern Kansas all in one day, enough to think about as we travel to our motel In Lawrence, Kansas. 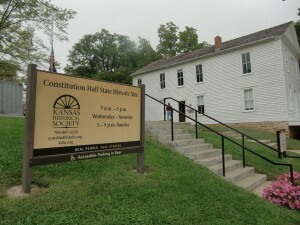 The original Constitution Hall still stands in Lecompton, Kansas, the site of the battle for the future of the state. Would it be a slave state or a free state? Notice about abolishing the first constitution and designing a new one in which Kansas would be a free state. 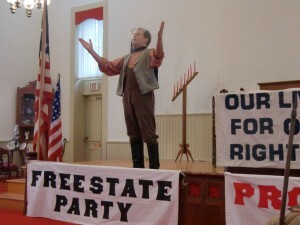 At Lane University we see a play put on by local actors about whether Kansas would be a slave state or a free state. 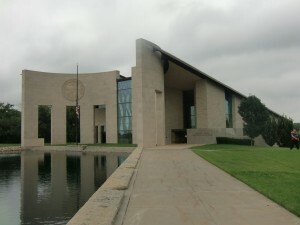 The Dole Institute from the outside. It is located on the campus of the University of Kansas.